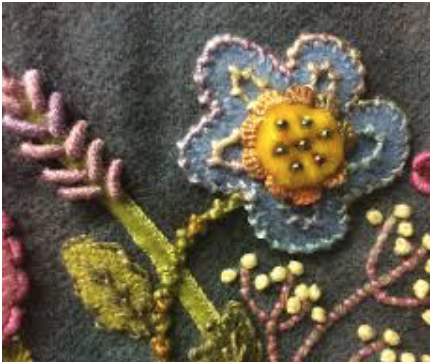 Have you ever wanted to learn how to embellish your appliqué projects with some creative hand stitches? My name is Mary Lou Heinle and I’m teaching a beginner class on creative stitches. Together we will learn about different needles sizes, thread weights, and, of course, beautiful stitches. > Needles: size 24,chenille, size 11 straw, size 1 milliners needles, we may use other needles but the book we will be using will provides the sizes. This is just what we need to get started. > Threads, we will be using a variety of sizes and colors and textures. > For our first class we will be using the bobbin threads in the blue ring, available at the quilt shop. This thread is perfect for stitching down our wool flowers and leaves. You can wait for class to purchase the threads, needles and wool. There is a 10% discount on class supplies. I like to go over all the products I use at the beginning of class. I will gladly help you pick out what you need! Materials Included: Some thread samples will be given each time, to try out new things. Requirements: Please sign up as soon as possible. Recurring students and students signed up in the Wool BOM will receive a class fee discount.